At La Porte Hospital, Dr. Neil Wangstrom delivers patient care with the aid of state-of-the-art technology and trained medical personnel. But every February, Wangstrom, an ear, nose and throat specialist for more than 20 years, leaves his comfort zone to help those with limited access to doctors and medicine. Since 2010, Wangstrom has traveled to Antigua, Guatemala, with other doctors, nurses and specialists to provide much-needed medical services and surgeries to men, women and children who have little or no income. This mission work is through the Houston-based group Faith In Practice. 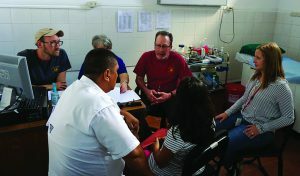 “The mission of Faith In Practice is to improve the physical, spiritual and economic conditions of the poor in Guatemala through short-term surgical, medical and dental mission trips and health-related educational programs,” according to the organization’s website. Faith In Practice began in the early ’90s to help orphans and people in need through a partnership with the Franciscan brothers. The nonprofit sends doctors to Las Obras and Hospital Hilario Galindo, among other locations. Wangstrom became involved after he was invited to go on a mission trip by a colleague about nine years ago. “It turned out to be a pretty good experience,” Wangstrom said. Volunteers include doctors who specialize in orthopedics, gynecology, urology, dental, and ear, nose and throat. Liz Sawaya, a clinic manager with Porter Health and a colleague of Wangstrom, said those he works with enjoy listening to stories about his mission trips and admire his dedication to providing care to people in need. Wangstrom said the surgical area of his Guatemala mission trips is in a monastery, which also is home to children. Some of them were abandoned by their families, and several have assorted conditions, including cerebral palsy. Once on the ground, the team readies their treatment space and prepares to meet patients. While the monastery is in a city, many patients often come from “the bush,” or outlying regions. “(People seeking care) are coming from 10 to 12 hours away, and a lot of times that’s walking,” he said. As a veteran missionary, Wangstrom knows what to bring along. The first few days are set aside meeting with patients and evaluating their immediate medical needs. Of the 60 to 70 patients Wangstrom might see during his 10-day stay, about 20 to 30 might need surgery. Some of the patients, Wangstrom said, often suffer from lung problems.